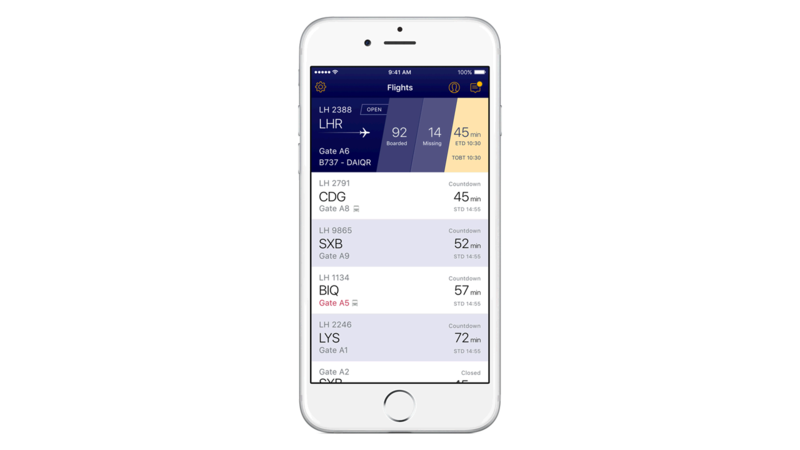 IBM MobileFirst for iOS Manage Gates lets customer service agents plan and monitor the flight and boarding processes while receiving timely flight information. The app provides automated shift planning and allocation of flights to customer service agents based on defined business rules. It enables supervisors to prioritize notifications and focus on critical changes. Next best action recommendations help to improve performance by enabling consistency of agent decision making on issues such as: open and close check-in and boarding process, deciding version change, deciding on last-minute ticket sales, waiting for passengers and unloading baggage. Touch ID and single sign-on provide secure access to information at the point of engagement to improve productivity. Push notifications can be used to immediately inform agents of critical changes for timely action. The app also enables voice dictation and location services. Customer service agents get real-time access to critical information in a central place. It reduces the time they would usually spend tracking down current information. The app makes it easier to share requested information and updates with boarding passengers. The app also improves operational analytics and communication among everyone involved including: flight managers, cockpit, weight and balance, ramp agents, agents at other gates and passengers. Boost in-flight sales using predictive analytics. Get proactive troubleshooting and sharing of mechanical expertise. Enable pilots to easily prepare and plan flight missions. Increase pilot productivity with a single view of flight information. Ensure aircraft upkeep and meet on-time arrival and departure targets. Address traveler needs from beyond the counter. Rebook flights while in transit – and more. Make informed decisions about fuel to save money. Speed boarding by going mobile. Improve client satisfaction and the sales winning rate. Train attendants have relevant travel information at their fingertips. Improve on-time train departures and passenger satisfaction.